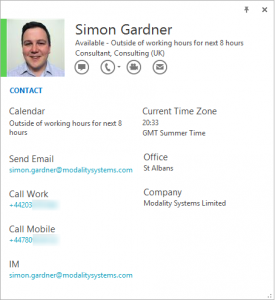 A requirement on a recent project was to have extra information displayed in the Lync contact card. For staff who have an assistant, their Active Directory account is populated with the assistant’s name and telephone number (in the msExchAssistantName and telephoneAssistant attributes), and this is useful to see at a glance within Lync, as they may be the best route to get in contact. Microsoft publish information about customizing contact cards via registry keys on TechNet, which we tried, and couldn’t get it to work. Instead we went down the route of customizing Office 2013 via the official Group Policy templates. If you’ve not made any changes to Office 2013, you may not have these installed. Download the package then extract the files. Included is a handy reference in Excel form which tells you what each setting does and the registry key it sets. You can either copy the contents of the “admx” folder to C:\Windows\PolicyDefinitions on the computer that will run the Group Policy management tools, or to the \policies\PolicyDefinitions\ folder on the SYSVOL for the domain. 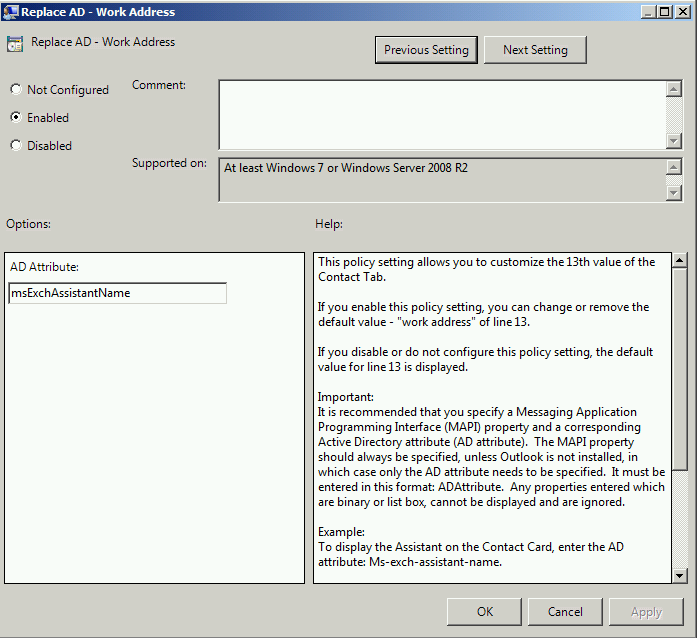 Open up Group Policy Management, and under Group Policy Objects, create a new GPO for testing. Right-click it and select Edit. Contact Card settings are under User Configuration > Policies > Administrative Templates > Microsoft Office 2013 > Contact Card > Contact Tab. If you refer to the helper text or the Excel reference sheet, it shows the line number for each piece of information – generally they go from most to least commonly used. In our case, we needed everything up to “Company” (12th line), which left line 13 and 14 to be replaced with new information. Line 13 is “Work Address”, so we went into the “Replace AD – Work Address” setting and put in the AD attribute that we want to use to populate the field – msExchAssistantName in our case. We also need to change the corresponding label on the contact card so that it displays something appropriate for the new info. 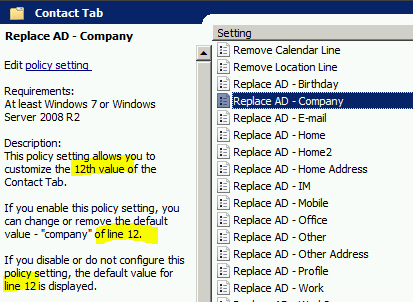 The “Replace Label – Work Address” setting was changed to “Alternate Contact”. This was repeated for line 14 (Home Address), for display of the assistant’s telephone number. There isn’t a documented limit for label names, but tried to keep this at a similar length to others so used “Alt Contact Number” as a label. To try out the changes, either apply the GPO to a test machine/user or set the registry keys manually. All Office 2013 application will have to be closed and restarted to see the changes. Success! We now have a contact card displaying the name and telephone number of the assistant. Extra phone numbers (such as in this example) often can’t be clicked to dial – they display as simple text. The contact card comprises the Calendar information (which can be turned on or off) then 16 items of information, with no possibility to add more than this. You are always replacing a (hopefully unused or unimportant) field with another. It’s possible that what is unused by some users is considered important by others. Information is always shown in line order – so if you replace “Home Phone” (line 6) it will always appear before “Office” (line 11). You may need to move the default ones to a different line to get the order you want. Since I did this work, the Skype for Business client was released. 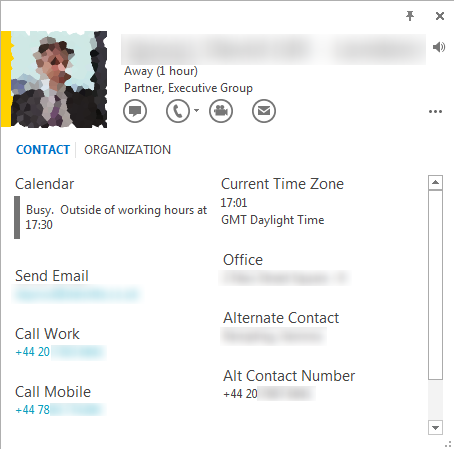 I’m happy to confirm that as this uses the same Office 2013 contact card, the changes work the same regardless of whether you use the Lync 2013 UI or the Skype for Business UI.